"What more can I ask? Oh, the daily activity sheets, the parent/teacher evaluations for progress milestones, the field trips for big kids, the Make-a-Wish drive and graduation and all the holiday parties in between that create a community out of our families, you get all that too! This is not a child-care factory or franchise. It's a family." - Jennifer M.
Children and Staff of Discovery Day Care of Morrisville present the Make-A-Wish Foundation with a check for their Carnival Graduation Fundraiser with recipient Javien. 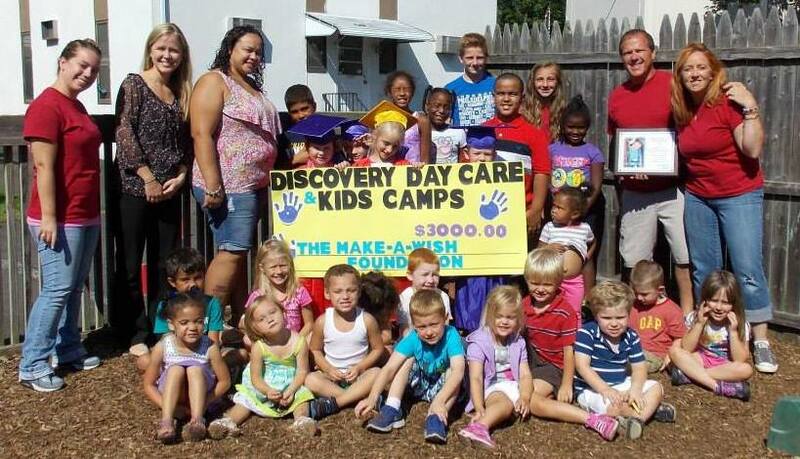 The Graduating Pre-K Class of Discovery combines their Graduation efforts with a Fundraiser for The Make-A-Wish Foundation. Each time, we have sponsored a local child, making the experience personal to all the children involved. 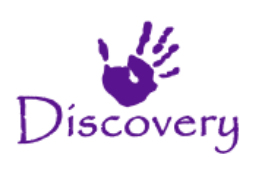 Discovery Day Care of Morrisville Staff and their Amazing Families have raised over $12,000 through personal donations & silent auctions, making Dreams Come True for children with life threatening afflictions. Click the link below to learn more about the Philadelphia Make-A-Wish Foundation. We feel it's important to teach children social responsibility. 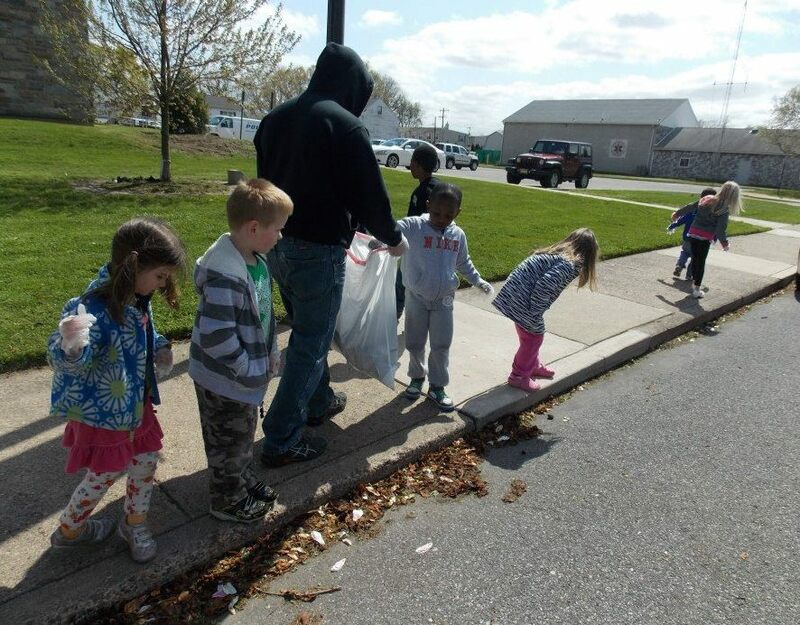 We do so by having all our age groups participate in Community Service Projects throughout the year. Whether it's Singing Christmas Carols at the Senior Center or Saying "Thank You" to the Police and Fire Departments on Patriots Day, the children learn that giving is as rewarding as receiving. 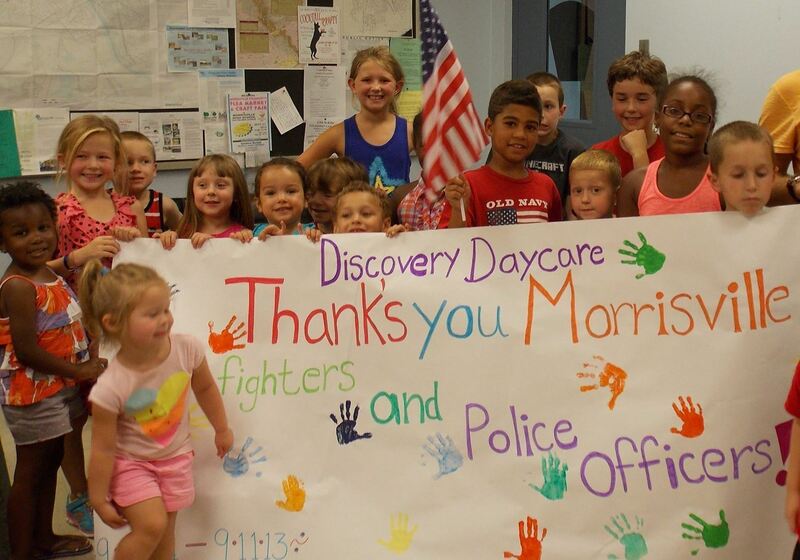 Discovery Day Care says Thank You to the Local Heroes of Morrisville on 9/11, Patriots Day. Every Thursday from September to June, Discovery Day Care of Morrisville is treated to Story Time with Miss Sue courtesy of the Morrisville Free Library. Children hear stories based on Seasons, Holidays and topics our Teachers suggest based on our own Calendar of Special Events. The Library is part of our curriculum for our Kindergarten Enrichment Program and in the Summer Months, we join in on the weekly programs the Library also offers. To learn more about the Morrisville Free Library click the link below. The Delaware River and Canal Path are just walking distance from Discovery Day Care of Morrisville and are utilized by our Teachers for Nature Walks throughout the year. Children can see wildlife such as Geese, Ducks, Fish, and the Amazing Blue Heron pictured here. Older children in the After School Program and Summer Camp go Fishing for Trout and Blue Gill in the Warmer Months too! To Learn more about the Delaware Canal State Park click the Link below. For 12 Years Discovery Day Care of Morrisville has started their Families weekend's off with a very Happy Friday. You can hear the shouts of "Bagel Friday" from all the children as they are greeted with Warm Bagels and Cream Cheese every Friday morning in our reception area. A nice little treat to end our busy Week! Breaking bread together on Fridays turns daycare friends into a second family. Every year we celebrate our Families by having a Family Tree created for each Child for Family Heritage Week. We top off the Week with a wonderful party for all generations to enjoy. The children take so much Pride in sharing the project to their Friends and then having the added bonus of having Grandparents, Moms, Dads, Aunts, Uncles and even Cousins come to Discovery to see their work, meet their Friends and participate in the event by bringing in a Family Favorite Food Dish to share. 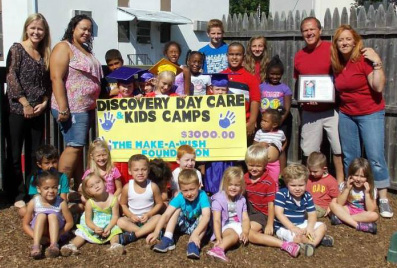 Discovery Day Care's School-Aged Programs keep us in touch with the children enrolled in the Elementary Schools in the area. We talk to the Teachers, Staff, and PTO Members throughout the school year keeping us aware of curriculum, events, and fundraising efforts. Whether we are donating our time to guide a child at a Book Fair or handing out Water Bottles filled with Lemonade at Field Day... It's one more way to demonstrate to all the children of Discovery our commitment to our community and our children's future. Discovery has an ongoing Policy that is simple... Recommend Discovery to a Family Member, a Friend, a Neighbor or even a someone standing next to you in the grocery store. If that person signs up to become part of our Family... You are rewarded with a $50.00 Gift Card! There is no limit to the amount of times either. We are so happy when others share their stories about their experiences here at Discovery and even happier to see the smiles a little "Thank You" can bring. Everybody's Irish on St. Patrick's Day... And Every St. Patrick's Day all the Children and their Families are treated to a little "Taste from the Irish" from Discovery. A buffet of Corn Beef, Cabbage, Potatoes and Rolls greet the families at afternoon pick up for all to enjoy. Like Bagel Friday... Another opportunity for our Families to break bread, chat and get to know each other a little better.